FalkeEins - the Luftwaffe blog: Oblt. Johannes Naumann..leading ace of JG 6 ? Oblt. Johannes Naumann..leading ace of JG 6 ? 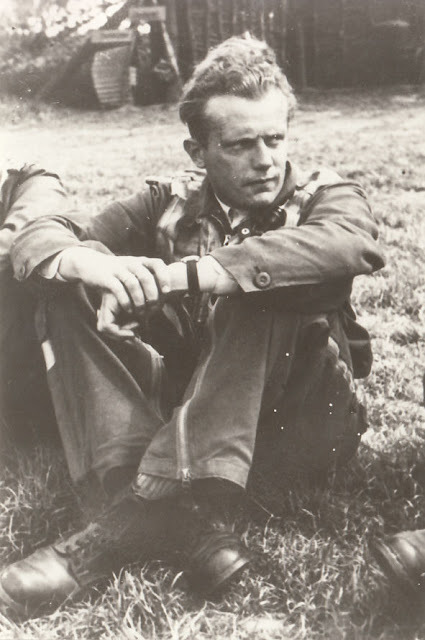 Naumann joined JG 26 in 1938 and was a long-time Staffelkapitän of 6./JG 26. He was badly injured on 23 June 1944, shot down by anti-aircraft fire south-west of Caen. Awarded the RK on 9 November 1944 as Kommandeur II./JG 6 - insgesamt 34 Luftsiege im Westen - 34 victories in the West including 7 bombers in around 350 combat missions. Ended the war with JG 7. His 1st victory, a Spitfire (n.b.) off Folkestone on 12 August 1940. A 2nd, a Spitfire 10 km SE of Southend on 3 September 1940. A 3rd, a Hurricane W of Boulogne on 21 June 1941. A 4th, a Spitfire on 3 July 1941, no location. His 5th, a Spitfire on 21 August, 1941, no location. His 10th victory, a Spitfire northeast of Rue on 13 February, 1943. Another victory, B-17 # 41-24399 "Man O War" of 91st BG, 323BS, flown by 2/Lt Keene C. Mc Cammon on 30 July 1943. Eight were KIA, 2 POW. On 26 July 1943 he shot down a twin engine Boston III RAF No. 88 Sqdn as Stfkpt 6./JG 26. Appointed Kommandeur II./JG 26 from March 1944. He was shot down on 23 June 1944 by British anti-aircraft fire and had to bale out but both his legs struck the rear of his FW 190 A-8, WNr. 730425, "black 30" resulting in severe injuries. He had at least 27 victories with JG 26. He was replaced by Hptm Emil Lang. He returned to combat operations as Kommandeur II./JG 6 and returned a double victory on 12 September 1944; both P-38s in the Düren-Zülpich area. A P-38 E of Cologne on 4 October 1944. He led II/JG-6 on the Volkel airfield raid on 1 January 1945. Deceased 22 March, 2010 Fürstenfelbruck (P. Bastin).